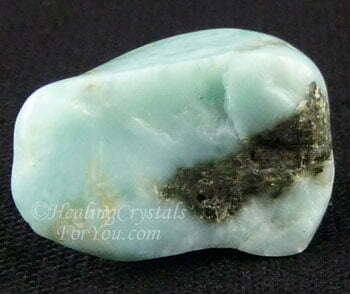 Larimar stone is an active throat chakra crystal, that has a vibration that assists clear communication. 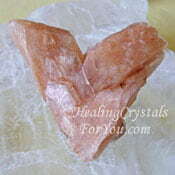 It has powerful metaphysical properties that help to dissolve emotional barriers. Its energy will quicken your contact with the Goddess and by accessing the Divine Feminine you may soothe and heal your emotions and release stress. 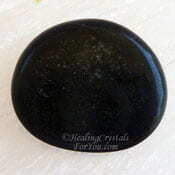 This is a highly spiritual stone that works effectively within all of the chakras from the heart chakra through to the crown chakra, including the higher heart, which aids compassion. It helps to release stored negative emotions such as angry thoughts, remembered pain and other detrimental emotions that are not benefiting you. 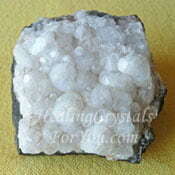 This stone is also known by various names including Atlantis stone and Stefilias stone. This blue stone is found in only in the Dominican Republic in the Caribbean Sea. 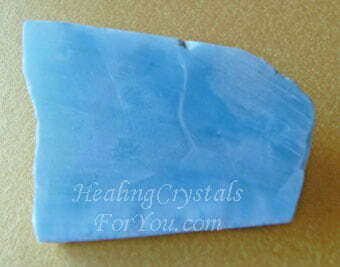 It is in this one location in the world, on the island of Hispaniola that this type of Blue Pectolite is found. Other varieties of Pectolite have been found in other parts of the world, including USA and Canada, but are usuaully named Blue Pectolite as Larimar is a registered trademarked name. Within these lovely stones there are interesting patterns of blue, white and blue-green, as well as white veins through the stone. 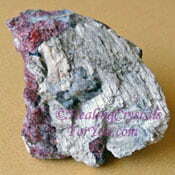 Some of the stone may also have inclusions of grayish black or red-brown Hematite within it. The meaning of this stone's name is related to the man who who rediscovered it in 1974, Miguel Mendez. 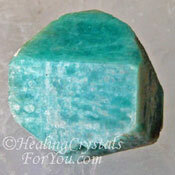 The meaning of this stone is associated with his daughter Larissa. He used the first three letters of his daughter Larissa's name... Lar.. and the local word for the sea ...mar, to create the name Larimar. 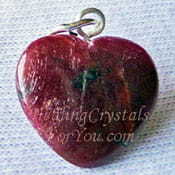 Healers may use this stone in layouts at any of the chakras from the heart chakra up, but it is most effective at the throat and the heart chakra. Within the thymus or higher heart chakra, its vibration will aid you to forgive others that may have caused you difficulties, and to clear deep seated emotional pain. 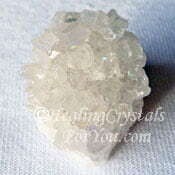 They are powerful healing crystals for you to use to aid you to release deep seated pain, resentment and fear. It might be helpful to wear a piece close to the where you are feeling the pain, to keep the energy working at its highest capacity. 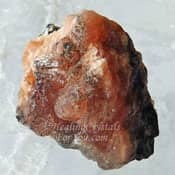 It is an excellent stone to aid you to clear any negative entities or other attachments, and is a helpful stone if you have side effects related to a kundalini activation, as it is calming and soothing. It is said to aid blood pressure problems and soothe infections in the chest, throat and head as well. 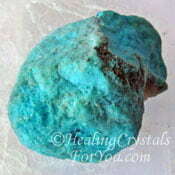 You may wish to place a piece of Larimar stone on the sore spot to aid your healing. 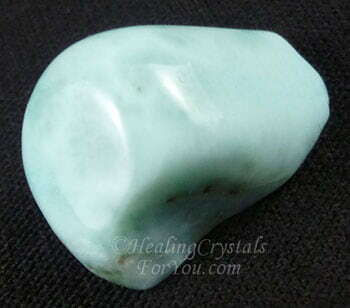 Shop for lovely pieces of Larimar Stone at Exquisite Crystals, who sell high quality crystals. 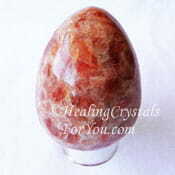 It has a strong healing vibration that will help you if you have problems managing anger, as it is cooling to the emotions, and the energy of this stone is known to help to enhance your creativity. It may help you to find creative ways to accomplish your soul purpose in this incarnation as it encourages spiritual perception. Larimar stone is easy to buy, and there are two powerful ways to use this stone with both being highly beneficial. 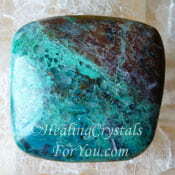 One of the ways you may choose to use it is to wear this stone. 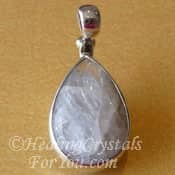 Wearing this crystal will keep the energy within your auric field constantly, or you may use it in meditation or do both. 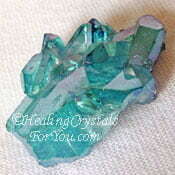 It is a strong asset to aid meditation, and brings through a wonderful feeling of relaxation. 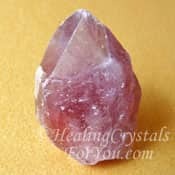 This is a truly spiritual stone that performs successfully when use within any or all of the chakras from the heart chakra through to the crown chakra. By holding a piece during meditation you may accentuate its vibration to aid you to contact angels and to connect with the Goddess. It will also improve your connection with nature. 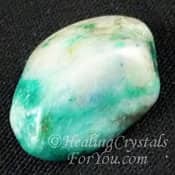 It has a decidedly spiritual energy that is said to aid ascension, and to help you to let go of connections with other people that are not for your highest good. It also enhances your communication and will enable you to say things to others that may be slightly uncomfortable in some circumstances. 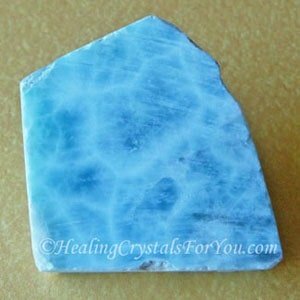 This blue crystal is helpful at this time, as its vibration helps to make the communication be more acceptable to the hearer. The Larimar meaning relates to the way it helps you to clearly say those things that you need to say, in a way that others will understand. 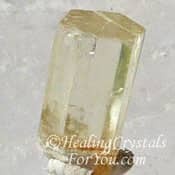 They are helpful healing crystals for you as their vibration is all about how you communicate, as they resonate primarily through the throat chakra. 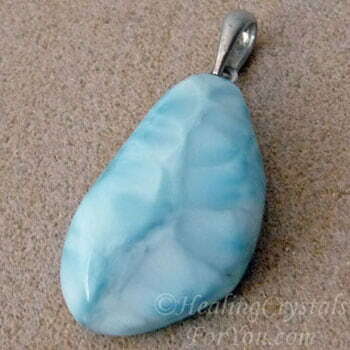 Wearing a Larimar stone pendant is the easiest way to use one of these crystals. 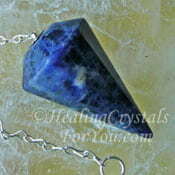 This lovely blue stone is good to wear as a pendant, as its energy resonates within the throat chakra stone. It is on the list of zodiac birthstones, and this delightful blue stone makes very attractive jewelry, including lovely pendants, earrings and rings. Jewelry made form Blue Pectolite is easy to buy, and wearing a pendant made from this lovely stone will help you to feel calm and relaxed. 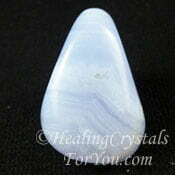 Finding jewelry made from Blue Pectolite is easily managed as it is found in a variety of different styles. 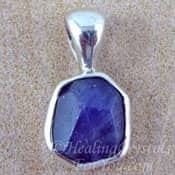 As it is a birthstone for Leo, this means that it is more likely that you will find birthstone pendants and earrings made from this stone. 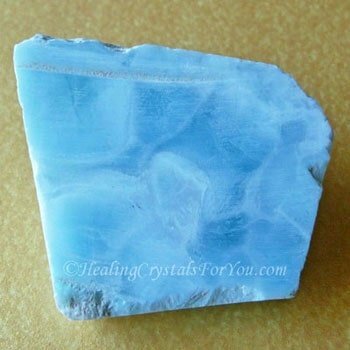 Larimar stone inspires self assurance and helps you to develop a bright cheery temperament. 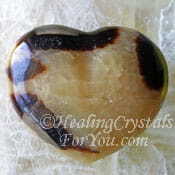 This stone of the Goddess augments your feminine power and your connection to Divine feminine energy. The vibration of these beautiful blue crystals resonates within both the heart chakra and the thymus or higher heart chakra, to help you to break down barriers around the emotions. Due to all of the earth changes happening now, this is an important stone to use at this time. 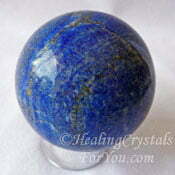 This beautiful blue stone will soothe and heal your emotions, and it helps to relieve stress. 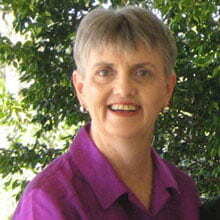 "We think sometimes that poverty is only being hungry, naked and homeless. The poverty of being unwanted, unloved and uncared for is the greatest poverty. We must start in our own homes to remedy this kind of poverty." Mother Teresa. 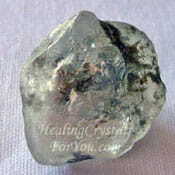 To emphasize this stone's connection with the higher realms, you may choose to use it with some of the high vibration crystals. 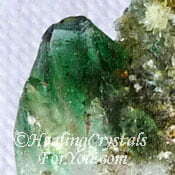 High energy crystals such as Datolite, Phenacite, Aurora Quartz also known as Anandalite, Tibetan Tektite, Moldavite, Natrolite and Tanzanite will combine well with it, and will aid you to reach the higher realms during meditation. 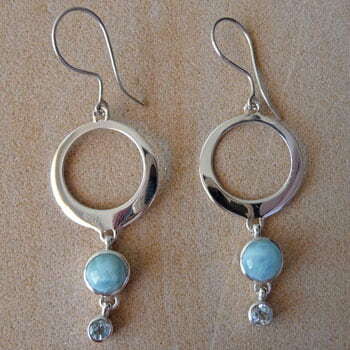 Larimar Stone will stimulate contact with the Goddess. 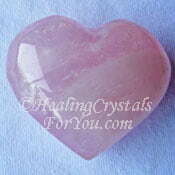 By contacting the Divine Feminine you may calm your emotions and free yourself from stress. 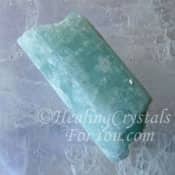 Lemurian Crystals love to be combined with Larimar. Using this stone together with the quartz energy helps to amplify the vibration, to assist you to make contact with the Goddess. 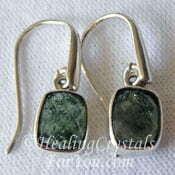 It also combines well with Green Diopside, Ruby Stone, Stellerite, Septaria, Lepidocrocite and Sunstones. 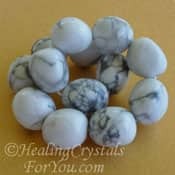 You may choose to use crystals such as Agrellite, Stellerite, Green Calcite, Black Jade, Rose Quartz, Howlite, Obsidian, Blue Lace Agate, Thaumasite or Hureaulite. 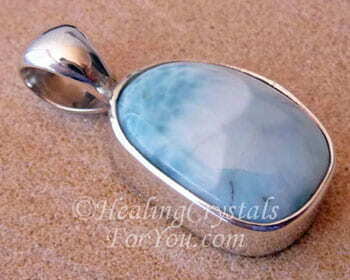 You may choose to combine Larimar with other blue throat chakra stones. In particular Aqua Aura, Aqua Lemuria, Ajoite in quartz, Amazonite, Chrysocolla, Blue Turquoise Crystals and Aquamarine Crystals blend well with it.